While surrounded by his very large family, Alan Crowe passed away on Saturday, October 28, 2006 after his long battle with pulmonary fibrosis. 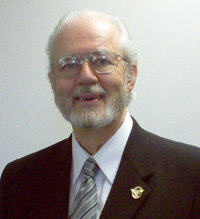 He was a founding member of NAPPS and its longtime Administrator. NAPPS was often referred to as his seventh child (he had six), nurturing it, caring for it and giving to it as unselfishly as he did his own. His love and kindness touched so many. The Memorial Service was open to all who wanted to attend in downtown Portland, Oregon on Saturday, November 11, 2006.